I’ve found, in general, that most fans either love Finn, tending to be apologists for his more recent behavior, or they hate him, and condemn him for his more recent behavior. I think that this rift in opinion is a direct result of the writers screwing up his character arc: the Finn apologists value the original intent of the character and turn a blind eye to what he’s become, and the Finn haters only see what’s right in front of them and forget what his original purpose was. I think, however, that the healthiest way to approach the situation is to acknowledge Finn’s recent behavior as being wildly against what his character arc should be and keep hoping it will right itself in the future. To me, the most discouraging evidence against this hope is that the writers seem to be completely oblivious to the fact that they indeed have obliterated Finn’s original character arc. It’s like they’re still trying to project what we should be feeling for the character, without providing any of the content that would lead us to that conclusion naturally. In essence, they are expecting the audience to follow along with Finn’s arc without actually manifesting it onscreen in any meaningful way. Finn as a character seems to be treated with all the fanfare of his original intent, but without any concrete evidence of him embodying it. Every time he is onscreen, the writers seem to be putting a giant light-up sign behind him that screams, “He’s a leader! He’s a good guy!” But the fact of the matter is that Finn has successfully exhibited very few of these qualities consistently since the First 13. If we’re going to talk this talk, then the character has to walk the walk. Actions speak louder than words! Show, don’t tell! All the hallmarks of good writing indicate that we will believe a character is a good guy when he acts like one, not when people say he is. That is empty, and hollow, and disrespectful to fans of the character - and the character himself. To look at things from the opposite side of the same notion, I would posit that this discrepancy is also a major contributing factor to a lot of the anti-Finn feelings stirring in some Glee fans. When the writers aren’t honest about the character, it tends to feel like hypocrisy - like they’re trying to manipulate the viewers into liking the character when in reality he should inherently be likeable if his character arc weren’t such a blazing hot mess. In this respect, it’s fair to say that much of the vitriol directed towards Finn as of late should probably be redirected towards the writers themselves. When I was going through screencaps of Finn for this project, I noticed that 80% of them showed Finn in some level of confusion. At first, I laughed. And then, I realized that this is actually kind of awful. Finn should not be perennially confused, no matter how dim he is. And he should definitely not be confused anymore. I think it’s possible that the writers think that confusion is one of Finn’s headlining traits, but in reality they are drawing the wrong conclusions. Finn should not be confused about his priorities anymore. The only time Finn should have ever been confused was in the melee of the pregnancy storyline. That messed with his head, and rightfully so. But everything else - Glee, football, popularity, Rachel? Finn proved he had his head on straight, and therefore should continue to have his head on straight. He may not be the most intelligent character, but a lack of intellect does not have any bearing on the capacity for right and wrong, especially considering that Finn didn’t use to have that problem in the first place. Confusion defined his interactions with one of the plotlines, not his entire character. Ultimately, this exploration of Finn Hudson has shown that the character’s original arc needs to be manifested onscreen by respecting his original choice of Glee club, and honoring the relationships that came about as a result. Finn needs to be earnest, genuine, and open to joy. He should be a character that makes choices - but not necessarily between popularity and Glee. He needs to stand up for what he believes in. He doesn’t have to be perfect, but he has to try. He needs to say yes, and do his best. He needs to get up on that stage every time and sing his big ol’ heart out, no matter what. And most of all, the writers need to adjust the way in which they write the character. They seem to be disconnected from the true content of Finn’s character, and are focusing only on what is essentially just an echo. Finn needs to get his voice back, and it’s up the writers to make that happen. They don't need to force his likeability. If they remain true to Finn Hudson's original intent, the likeability will come naturally. Until then, we can only hope that they remember why the character was compelling in the first place and wait for them to put that back on our TV screens. 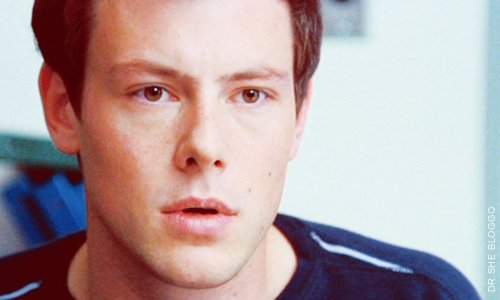 Ladies and gentlemen, thus concludes Finn Hudson Week. This exploration was upwards of 6000 words, so I thank you for reading, and for the feedback! Based on the few minutes of the promos, it seems as if the writers are going the completely opposite way. *Sigh* I hope the promo scenes were misleading and the episode doesn't turn out that way...but who am I kidding. We've been burnt so far. I'll be in the corner just appreciating Cory's acting skills. Thank you for writing this. It was a treat to read such a clear-headed analysis. Katy - thanks so much for your kind words. I haven't watched many of the promos yet, but I hope that I won't want to throttle the writers for what they're doing to Finn's character. But I guess I should be realistic. I'll probably be in my own corner, singing happily along to the music and enjoying the show's strong comedic moments, haha. I wanted to thank you on your posts this week. Finn is my favorite character and I love Finn and Rachel together. All this season, I have been frustrated by how Finn has been written (because I agree with you that the writers ultimately are to blame) because this isn't the Finn I know he can be. They continue to regress him, have him "learn a lesson" and repeat. And they're killing the character within the fanbase. Based on the promos, I fear that he will used as a prop for the next two episodes to further Quinn's story/character development (with a possible side of Santana development) and another nail will be put in the coffin of Finn "Hypocrite" Hudson. I just want S1 Finn back. If he is written with his best characteristics shown, everything else (releasing the tight grip on the desire for popularity, Rachel, family relationship with Kurt even, etc) will fall into place (IMO). I'm glad you enjoyed the posts! I haven't seen many promos, but I'm worried as well that whatever "development" they have planned for Quinn is not going to do her character any good either. And if it's at the sake of Finn's character then it'll be kind of a lose-lose situation; sigh. Thanks for reading, and the comment! From what I've read of the spoilers for the next two episodes (which is, unfortunately, a lot, since someone posted an entire recap of the "Silly Love Songs" episode) I think we're in for a reverse development. I'm not going to say anything more because I feel like I've already written half a novel tonight on this entire topic, so I just thought I'd tell you that I truly loved your analysis of Finn's character arc (or lack thereof). It is spot-on, and I truly wish someone on the writers' team would see it and realise what it is they are doing. It's a credit to Cory's acting skills that people remain so loyal to Finn, because he still manages to make the best of a bad situation. I'd be really curious to see what your take on it is after Tuesday. Oh, I've heard some whispers on the wind, and by that I mean I've heard a lot of angry fans, haha. I haven't watched any of the clips or anything, so I'm reserving my judgment until I've seen the episode. I've got my fingers crossed for at least a decent execution. I don't have too many opinions on what the writers are choosing to do as long as they're doing it well, y'know? But yeah, I'll definitely have my recap up after the episode and hopefully I won't be raging. And thank you so much for reading! It is indeed frustrating that the writers seem to be missing the mark so much with Finn's character. It makes me feel bad for Cory and all his fans, too. So You're Not Married - Who the F*** Cares? The RBI Report: "Blame It On The Alcohol"
The RBI Report: "The Comeback"
The RBI Report: "Silly Love Songs"
The RBI Report: "The Sue Sylvester Bowl Shuffle"